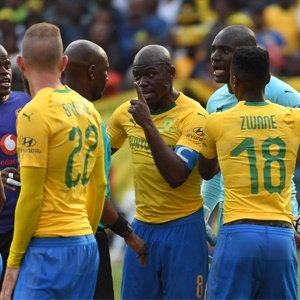 Cape Town - Mamelodi Sundowns captain Hlompho Kekana has hinted he is eyeing adding an AFCON crown to the CAF Champions League and Super Cup he won with the Brazilians. Kekana was a part of the squad that qualified for the Africa Cup of Nations last Sunday when they defeated Libya 2-1 in a Group E tie in Tunisia. Percy Tau proved to be the difference as he scored a brace while Darren Keet gave a superb performance in goal for the national side. Nonetheless, the Sundowns destroyer also nearly had an impact when he almost scored from distance after coming on as a substitute. The 33-year-old won the CCL and Super Cup in 2016 and 2017 respectively and was a major influence in both successes. Speaking to Kickoff, he said: "It's a special feeling. I'm very proud of some of the achievements I've achieved so far in my football career and qualifying for major tournaments is always one of the goals I have. "When I check, this is one of the things I had written in my notes when I was young, that I want to see myself qualifying to play at AFCON. "Going to AFCON will be something special for me. I've ticked many boxes in my career, I've won the league, the Champions League, Super Cup and now I was part of the team that helped South Africa qualify for AFCON. It's really a special moment."